Since the early 1990s, there has been an emphasis in international relations theory on the shift from a Cold War rationality of ‘threat’, to a post-Cold War rationality of ‘risk’. 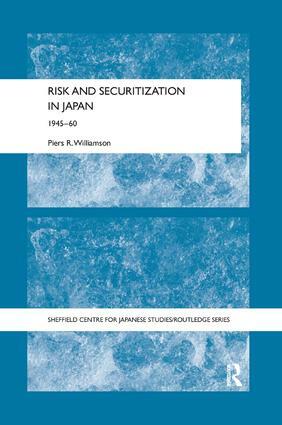 However, in Risk and Securitization in Japan, 1945-1960, Piers R. Williamson argues that this assumption of a shift in rationality stems from a fundamental failure to distinguish between the concepts of threat and risk. By clarifying the concepts of threat and risk, this book challenges the prevailing hypothesis of a shift from threat to risk with the end of the Cold War, and in doing so presents a new explanatory model of risk that can be applied to Japan and elsewhere. In turn, it proposes that a full comprehension of the concept of risk can generate new understandings of political processes that would otherwise remain obscured. Williamson demonstrates how this can be done, proffering a new perspective on Japanese security discourse, especially the controversy between, on the one hand, early Japanese governments, prime ministers, Diet members, and those Japanese who drafted the Japanese proposal for the new constitution, and, on the other hand, intellectuals, peace movement activists, proponents of unarmed neutrality and the US-Japan security treaty. Including extensive archival material in the form of speeches, public statements and government documents, this book will be of huge interest to students and scholars of Japanese politics, international relations and history alike.